Rioja is undoubtedly Spain’s most famous wine region, often presented as the “typical Spanish wine” to first time visitors. Native to and synonymous with the region is the star grape of Spanish wine, Tempranillo (tem-pra-KNEE-yo). Perhaps no other Spanish wine region has diversified more than Rioja over the last two decades. The victim of the reshuffling was the Classic Rioja style, whose oak imprint and bottle aging brought spices and leather, earth and dried fruit, as well as criticism by the general public for being backwards and out-of-touch. The faith in their own product received an official stamp of approval three years ago, when two of the wine industry’s most famous magazines, Decanter and Wine Spectator, named two different Rioja Gran Reservas as the best wines of 2013…in the world. Decanter’s choice? 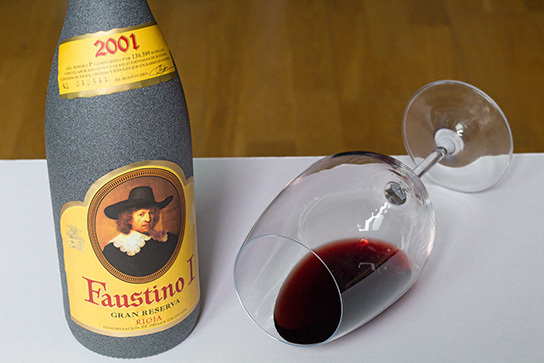 The very wine you’re about to discover, Faustino I Gran Reserva 2001. The wine region of Rioja is situated in northern central Spain, divided into 3 sub-regions that follow the course of the Ebro river, linking the autonomous communities of La Rioja and The Basque Country. Early on, Rioja wine production developed thanks to the monasteries that dotted the area, serving pilgrims on the famous Camino de Santiago as it criss-crossed northern Spain. Rioja’s big chance however came in the mid 19th century, with the arrival of two major events: railroads linking the region to the outside world via the port city of Bilbao, and the most devastating vine pest in wine history, the phylloxera louse. Phylloxera would wipe out over 70% of French vineyards, sending French winemakers – from Bordeaux especially – over the Pyrenees to present Rioja with the opportunity of a lifetime. As France’s new main supplier, Rioja enjoyed tremendous growth until phylloxera eventually invaded Spain as well. Some of Rioja’s most well-known wineries got their start during this period, including Marqués de Riscal, López de Heredia, CVNE, La Rioja Alta, and the winery looked at here, Faustino. France greatly influenced those early wines, and the 225-liter oak barrel used in Bordeaux became a fixture in Rioja. In the 19th century, barrels played a crucial role in a wine’s drinkability, as most wines suffered from under-ripe and astringent tannins that could only be softened through extended oak aging. The Riojanos took this to heart, and long barrel aging became Rioja’s calling card. Up until the 1930’s, wineries rarely stored bottled wine on site, as wine was maintained in barrels until an order had been placed, after which, newly bottled wine was immediately shipped out. Some wine historians believe that this is the origin of the terms Reserva and Gran Reserva, which described those wines that held out the longest in barrel without declining in quality. While time in oak was reduced over the decades to “only” a year or two, the majority of Rioja’s wines, even up til the late 1980’s, were heavily marked by the scents of slow oxygenation through oak’s tiny pores. In the 1990’s however, modern Rioja was born, partly in reaction to mistakes made during the rapid expansion of the 70’s and 80’s. Another factor was the success of the nearby Ribera del Duero region. There, Tempranillo was being used to produce wines of greater concentration, color, fruit and alcohol, becoming the darlings of international critics in the process. When many Rioja wineries followed suit, their new muscular, fork and knife wines were all the rage, much to the dismay of wineries like Faustino. Luckily, the world would later realize that drinkability, and not high point scores – matched by equally high prices – was what counted at the end of the day, culminating in the wine magazine awards mentioned above. Classic Rioja hadn’t been reborn per se, just re-recognized for its incredible worth. Faustino was founded back in 1861, and remains one of the largest family-owned wineries in Rioja. You might think their labels are just as old. In reality, they date “only” to the 1960’s, but their image – along with the hokey gray frosted bottles – have led many to dismiss Faustino I Gran Reserva on sight alone. However, judging this book by its cover would mean missing out on one of Rioja’s best values for classic Gran Reserva. While Faustino is still family run, a small operation it is not. In bottles alone, there are more than 9 million being aged at the winery. The company’s large size, along with its 1600 acres of estate vines, have allowed it to consistently put out wines of amazing value. The star of their collection is the Faustino I Gran Reserva, a wine that offers incredible complexity, a gentle palate, and the advantage of not being released for sale until deemed ready to drink. This formula has achieved so much success, that Faustino I is the best selling Rioja Gran Reserva, worldwide. With Classic Rioja, Tempranillo shows her best side when blended. Graciano and Carignan (called Mazuelo in Rioja) are common partners, and here they make up 14% of the blend. Given their acidity, tannin, and color contribution, these two are great additions for wines that are meant to age. The wine then spent 26 months in French and American oak before bottling. Its 15 years are evident in the pale cherry body and garnet rim. The nose is remarkably fragrant, offering red fruit liqueur, sour cherry, leather, potpourri, compact dried earth, menthol, fresh tobacco and sweet spice. The oak is extremely well integrated, with just a touch of toasted wood in the background. Bottle age has also brought on a slightly savory farmyard element, which pleasantly gives the wine some aromatic lift, adding to the complexity. On the palate there are more sour red fruits, earth and spice, with crisp acidity that keeps the wine fresh, and super soft tannins that stay in the back of the mouth. The wine is delicate and mellow, elegant and easy to drink, all of it crowned by great length. The Spanish supermarket chain Simply often stocks Faustino I Gran Reserva for just 16 Euros in their larger stores. Click on the link to find the closest store to you. The Spanish supermarket chain Mercadona also stalks a wide range of Faustino wines. This link shows all their locations in central Madrid. The department store giant El Corte Ingles has a supermarket and gourmet section that makes for one-stop shopping. The lack of charm is offset by a wide selection and numerous locations, the two most convenient of which are the 9th Floor El Corte Ingles Gourmet Experience (with incredible views) in Plaza Callao 2 – Metro Callao (Lines #3, #5), as well as the basement level Gourmet Club supermarket on Calle Preciados 3 – Metro Sol (Line #1, #2, #3). Open 10am to 10pm Monday to Sunday. *Photos of the Faustino barrel and bottle storage rooms courtesy of the winery’s website.